N. 1. Duettino: "Cinque dieci venti trenta"
N. 2. Duettino: "Se a caso Madama la notte ti chiama"
Recitativo: "Or bene, ascolta, e taci"
N. 3. Cavatina: "Se vuol ballare, signor contino"
Recitativo: "Ed aspettaste il giorno"
N. 4. Aria: "La vendetta, oh, la vendetta"
Recitativo: "Tutto ancor non ho perso"
N. 5. Duettino: "Via, resti servita"
Recitativo: "Va' là, vecchia pedante"
N. 6. Aria: "Non so più cosa son, cosa faccio"
N. 7. Terzetto: "Cosa sento! tosto andate"
Recitativo: "Basilio, in traccia tosto di Figaro"
N. 8. Coro: "Giovani liete, fiori spargete"
N. 9. Coro: "Giovani liete, fiori spargete"
Recitativo: "Evviva!" "E voi non applaudite?" N. 10. Aria: "Non più andrai, farfallone amoroso"
N. 11. Cavatina: "Porgi, amor, qualche ristoro"
N. 12. Arietta: "Voi che sapete che cosa è amor"
Recitativo: "Bravo! Che bella voce!" N. 13. Aria: "Venite, inginocchiatevi"
Recitativo: "Quante buffonerie!" "Chi picchia alla mia porta?" "Che novità! Non fu mai vostra usanza"
N. 14. Terzetto: "Susanna, or via, sortite"
Recitativo: "Dunque, voi non aprite?" N. 15. Duettino: "Aprite, presto, aprite"
Recitativo: "Oh guarda il demonietto"
"Tutto è come il lasciai"
N. 16. Finale "Esci omai, garzon malnato"
"Signori, di fuori son già i suonatori"
"Ah! signore signor" / "Cos'è stato?" "Vostre dunque saran queste carte"
"Voi, signor, che giusto siete"
Recitativo: "Che imbarazzo è mai questo!" "Via, fatti core!" N. 17. Duettino: "Crudel! Perché finora farmi languir così?" Recitativo: "E perché fosti mai stamattina sì austera?" "Ehi, Susanna, ove vai?" N. 18. Recitativo ed aria "Hai già vinta la causa!" Recitativo: "È decisa la lite"
N. 19. Sestetto: "Riconosci in questo amplesso"
Recitativo: "Eccovi, o caro amico"
Recitativo: "Andiamo, andiam, bel paggio"
N. 20. Recitativo ed aria "E Susanna non vien!" "Dove sono i bei momenti"
Recitativo: "Io vi dico, signor"
N. 21. Duettino: "Su l'aria " - "Che soave zeffiretto"
Recitativo: "Piegato è il foglio"
N. 22. Coro: "Ricevete, o padroncina"
Recitativo: "Queste sono, madama, le ragazze del loco" "Eh cospettaccio!" "Signor, se trattenete"
N. 23. Finale "Ecco la marcia andiamo"
Andante - "Eh già, la solita usanza"
N. 24. Cavatina: "L'ho perduta, me meschina!" Recitativo: "Barbarina, cos'hai?" "Madre! / "Figlio!" N. 25. Aria: "Il capro e la capretta"
Recitativo: "Nel padiglione a manca" "È Barbarina. Chi va là?" "Ha i diavoli nel corpo"
N. 26. Aria: "In quegli anni in cui val poco"
N. 27. Recitativo ed aria "Tutto è disposto "Oh Susanna, Susanna, quanta pena mi costi!" "Aprite un po' quegli occhi"
"Signora, ella mi disse Madama, voi tremate"
N. 28. Recitativo ed Aria "Giunse alfin il momento"
"Deh vieni, non tardar, o gioia bella"
Recitativo: "Perfida! e in quella forma meco mentia?" N. 29. Finale "Pian pianin le andrò più presso"
"Ecco qui la mia Susanna"
"Tutto è tranquillo e placido"
"Pace, pace, mio dolce tesoro"
Luxuriously presented and cast . . . [Nézet-Séguin's Mozart recording] oozes confidence . . . You are in his safe hands the moment Mozart's upstairs-downstairs comedy kicks off, the Chamber Orchestra of Europe buoyant, textures balanced, colours vibrant . . . the romp of a fandango that concludes Act III is a marvellous little scene-stealer . . . Sonya Yoncheva's magnificently melancholic Countess is a peach of a performance, lusciously, dreamily sung. Luca Pisaroni is an experienced Figaro and his velvety baritone is smoothly delivered . . .
. . . [from the first chords of the "Figaro" overture, Nézet-Séguin] establishes a bold, fully crystallized concept of Mozartean sonority and the psychological implications behind it . . . [Christiane Karg as the wily servant Susanna and Sonya Yoncheva as the Countess] are just wonderful . . . [Luca Pisaroni's Figaro] makes dramatic points not with his usual word articulation but with more microphone-friendly use of tone Color . . . Even small roles are cast with stars: Anne Sofie von Otter as Marcellina and Rolando Villazón as Basilio help sustain Act 4 . . . [the 50-plus "Figaro" recordings on CD and DVD] show how the opera showcases each generation of Mozart performers . . . Nézet-Séguin's recording takes its place among these touchstones. A great musical mediator . . .
. . . trim orchestral playing, extra vocal decorations and a restlessly inventive fortepiano continuo . . . [the dramatic concentration] is most vivid when Thomas Hampson's Count, his face always visible in the mind's eye, is sparring with the generous-voiced Countess of Sonya Yoncheva . . . All in all, this is a solid cast.
. . . expertly engineered by Tonmeister Rainer Maillard and Assistant Engineer Douglas Ward to both uphold Deutsche Grammophon's legendary standards of sonic excellence and preserve enjoyable aspects of the live-performance atmosphere, most notably the audience's blissful laughter, this account of "Le nozze di Figaro" unites Mozartean veterans with newcomers in a musical setting that fuses elements of period-appropriate practices with the extraordinary legacy of the opera's 229-year history. This emphatically is not a dainty, tempest-in-a-teacup performance, however: Mozart's, librettist Lorenzo da Ponte's, and playwright Pierre-Augustin Caron de Beaumarchais's drama surges from these discs, every sigh, smile, and stress vividly, lovingly brought to life . . . [why] does "Le nozze di Figaro" still challenge, amuse, and move? There is ample proof ripe for the hearing in this recording, which in terms of singing, conducting, and unwavering fidelity to the composer's genius is a concoction fit for the most gluttonous Mozart appetites.
. . . this is a pacy account of the composer's most popular opera, with wonderful woodwind playing. The casting is optimal for Figaro -- Luca Pisaroni, the finest on disc for his relish of the text . . . and Susanna, a pointed and beautiful Christiane Karg. Her Act IV aria is a highlight . . . Angela Brower is an enjoyable Cherubino . . . The ensembles zing.
. . . Pisaroni creates one of the most spot-on, lovable Figaros you are likely to encounter on disc . . . [Anne Sofie von Otter's] intelligence shines through phrase after phrase . . . [Villazón's voice is] handsome and steady. It's a marvelous performance on every level.
. . . well played . . . [time stands still in the finale when everybody hears the count's] "Contessa, perdono" (My Countess, forgive me) at the most drawn out ritardando on any recording, and with long pauses between the words, there is true magic created . . . If I remember nothing else from this recording that scene will forever be etched into my memory. Vocally there is a lot to remember here: the glittering Susanna of Christiane Karg, the marvellously detailed and expressive Marcellina of Anne Sofie von Otter . . . Angela Brower's creamy-voiced Cherubino, Rolando Villazon's youthful and ingratiating Basilio . . . the noble and beautiful Countess of Sonya Yoncheva . . . Luca Pisaroni, Figaro, has a fine voice and is expressive with words . . . and delivers his recitative and aria in the last act with deep involvement and biting anger . . . [Thomas Hampson] has retained much of his marvellous voice . . . Verbally and expressively he is masterly . . . The scene with Susanna at the beginning of act III and his big aria that follows constitute a high-spot in this recording . . . the balance of the sound is excellent . . . [this latest version of "Figaro"] is attractive with some very good singing from a cast where well-preserved veterans encounter the younger generation. The Chamber Orchestra of Europe is marvelous -- the strings silky but capable of sharp-edged attacks, the winds alternately spicy and sweet, and their ensemble work impeccable . . .
. . . [Yannick Nézet-Séguin's] Mozart operas recorded thus far all sound fresh and full of energy. This latest release is no exception . . . This is luxury casting by any standard, down to the smallest role; for example, Soprano Regula Mühlemann as Barbarina . . . is simply superb in her Act 4 cavatina and Villazón, outstanding both vocally and dramatically, gives us a sparkling, comic Basilio . . . Christiane Karg as Susanna and Luca Pisaroni make an ideal pair in this performance, with especially impressive warm and solid low notes from Karg in the aria "Deh vieni non tardar." . . . [Bulgarian soprano Sonya Yoncheva] sings beautifully here, with innumerable subtle nuances of phrasing . . . Nézet-Séguin elicits wonderful playing from the Chamber Orchestra of Europe, deftly combining a traditional approach to Figaro with some touches of historically informed performance practices . . . Nézet-Séguin's fresh and energetic "Figaro", with its mostly stellar cast, offers plenty of musical pleasure. The most striking quality of this "Figaro" is the transparency of the orchestral sound, enabled by DG's use of multiple, closely placed mics. Nézet-Séguin demands remarkably virtuosic playing from the Chamber Orchestra of Europe, revealing the inner details of Mozart's score with unmatched clarity. The overture brims with promise, as Nézet-Séguin enforces sprightly rhythms and brings out delightful contrasts of color and articulation . . . there is much to enjoy in this stylish reading. It features a stellar cast. Christiane Karg proves a lively lynchpin as Susanna, her performance alert and bright. The same can be said of Luca Pisaroni, whose baritone is lithe and characterful. Thomas Hampson proves he still has plenty of voice, and his Conte sounds duly amorous, confused and menacing in turn. Sonya Yoncheva turns in a grand Contessa . . . Maurizio Muraro hits just the right note as Bartolo . . . Nézet-Séguin keeps tight control without rushing, and the Chamber Orchestra of Europe plays cleanly and finely . . . it's definitely worth hearing. The COE play beautifully . . . Pisaroni's dark-toned Figaro is dangerous in "Se vuol ballare", bitter in "Aprite un po' quelgi occhi". The dotted rhythm of "Non più andrai" is foot-tappingly crisp and his pacing of the recitative when plotting with Susanna and the Countess is exemplary. As Susanna, Karg moves effortlessly from the spirited girl of Act 1 -- there's some delightfully playful decoration to the last phrases of the second duet -- to a tender, womanly account of "Deh vieni". She blends perfectly with the Countess in the Letter Duet . . . [Sonya Yoncheva's] open-throated singing is glorious . . . Angela Brower, a soprano-sounding mezzo, is a spirited, coltish Cherubino . . . [Anne Sofie von Otter is fine and] well partnered by the formidable Bartolo of Maurizio Muraro. Rolando Villazón is amusingly camp in Basilio's recitatives, and he crowns "In quegli anni" with a ringing top B flat . . . a more than acceptable addition to the series. A stellar cast impresses in Baden-Baden . . .
Nézet-Séguin does a reasonable job with the opera. He shows some deftness and grace. He allows some lilt. He favors the fast and punchy -- but he is not the Energizer Bunny . . . [in the title role Luca Pisaroni] is "streamlined," as I like to say. He is lean, pliant, smooth, accurate, and personable. He is well-nigh instrumental (no offense to singers). He is almost an ideal Mozartean in opera . . . [the Countess is Sonya Yoncheva, and in the aria] "Dove sono," she is downright stylish. Christiane Karg, the German soprano, is Susanna, and she sings beautifully . . . [and] comports herself with beauty and poise . . . [Angela Brower] fills her trouser-wearing bill . . . [Anne Sofie von Otter, the great Swedish mezzo,] dispatches Marcellina's music in utterly Otteresque fashion. In general outline the performance manifests strengths similar to those of the "Entführung": faultless orchestral playing, a fortepiano as continuo, and a full edition . . . It keeps going: rhythmic drive is not lacking, as the overture and Act 3 dance sequence particularly demonstrate, which is not a minor virtue . . . [Pisaroni is a] superbly multifaceted, finely-voiced Figaro in the grand Italian recorded line . . . a marvellously wily thinker-on-his-feet of a Figaro slower to forceful outburst than some . . . which makes his "Aprite un po", at once steady of tone and bitingly powerful and various in utterance, the high point . . . Von Otter proves to be an unusually sympathetic, attractively-voiced Marcellina . . . Villázon hams it up as Basilio through much of the opera while shedding the buffo shtick and turning in a strong vocal performance in his Act IV showcase . . . Bulgarian soprano Sonya Yoncheva makes for a most affecting broken-hearted Countess early on in her Act II aria and adds an alluring "Dove sono" later . . . Maurizio Muraro bring an imposing comic bass to Dr. Bartolo . . . in all, this is a good cast, and Yannick keeps the energy flowing . . . The presence of an audience is hardly noticeable except for a bare handful of muted collective laughs -- and praise be at a time of cost-cutting in the twilight of the CD era, the thick 236-page booklet contains a full libretto!
. . . the performance is fast-paced and dramatically focused . . . it is very welcome that all of the surviving arias are recorded here . . . The singers are to be commended for the alert realism of their recitatives and their interactive characterisations. Thomas Hampson is a rock-steady Count . . . Sonya Yoncheva gives the Countess some real passion in "Dove sono" and elsewhere . . . Luca Pisaroni's Figaro is confident and spirited . . . Villazón's Basilio is characteristically vivid . . .
. . . well cast, well played and conducted . . . [Nézet-Séguin makes] lively, sensible tempo choices . . . With Nézet-Séguin, the most notable sign of period performance influence, aside from the use of a chamber orchestra, is the enjoyable addition of a fortepiano, subtly decorating the orchestral accompaniment in quite a few arias . . . Thomas Hampson is the Count, one of his best roles, and to his credit he sounds much the same as in 1990. It's a carefully considered performance . . . essentially lyrical and beautifully sung . . . Christina Karg, a new luminary in the great succession of pure-voiced lighter German sopranos, gives the best performance here, elegantly vocalized and endearingly characterized. The young American mezzo Angela Brower is an appealing Cherubino . . . She's splendid in her first aria . . . [Sonia Yoncheva's] absolutely gorgeous tone provides great pleasure . . . [Luca Pisaroni's Figaro] sings with fine breath control and wonderfully articulated Italian . . . Maurizio Muraro is a deep voiced basso buffo, who wisely goes for bluster, not refinement . . . In sum, this performance is a very high-level ensemble effort . . . It is beautifully recorded, and I look forward to returning to it in the future. The singing is universally excellent -- Sonya Yoncheva's Contessa is passionate and glowing, one of the best portrayals in years. Likewise Luca Pisaroni's Figaro may be the standard for the youthful century. Thomas Hampson's third Conte is more reflective, less declamatory, a burnished and well-considered performance . . . Christiane Karg does fine work as Susanna, with no noticeable weakness and much spot-on emotional fervency . . . this live concert reading does a fine job of conveying Da Ponte's miraculously clear and convincing theatrical scenario. There is much, much to enjoy in this performance . . . Great fun, expertly rendered . . .
. . . [Nézet-Séguin] never loses sight of the work's comedy, but his effervescent reading also reveals the emotional resonance that makes it a humanistic masterpiece . . . It features singers who combine vocal accomplishment with musical and dramatic intelligence . . . [Luca Pisaroni gives] a reading both funny and touching. Pisaroni relishes articulating his native language; every word of da Ponte's libretto is a delight. Christiane Karg is a good match for him . . . [her Susanna has] a good deal of native wit, conveyed through the alertness of Karg's singing and the sharpness of her attack . . . The Countess is Sonya Yoncheva, who so naturally conveys vulnerability that just her vocal tone makes the character's plight tangible . . . her singing has dignity befitting an aristocrat. Yoncheva produces one of the most beautiful sounds in opera today, making her performance as sensuously enjoyable as it is affecting . . . Angela Brower, as Cherubino, deploys an appealing lyric mezzo of so bright a tinge that you could mistake her for a soprano. She nicely distinguishes her two arias . . . Von Otter's intact virtues as a singing musician justify the inclusion of her Act IV aria, a moment of delight . . . [Villazón's] tone is aptly suited to Basilio, and his intelligence as a singer informs his portrait of the wily music master . . . But the show belongs to Nezet-Seguin, who offers a reading so well gauged, and so bursting with life, that it continually provoked me to think, "What a wonderful opera!"
. . . [Yannick Nézet-Séguin] weist dem schlanken, aber scharf zupackenden Chamber Orchestra of Europe den dramatischen Hauptpart zu. Mit rasanten Tempi und trockener Präzision gibt es den atemlosen Lebenspuls dieses "tollen Tages" vor . . . Diesem historisch orientierten Ansatz des 41 -jährigen Kanadiers folgt die bunt zusammengewürfelte Startruppe mit erstaunlicher Disziplin . . .
Soulignons d'abord, la prestation superlative vocalement et dramatiquement de la soprano vedette de la production . . . Sonya Yoncheva renouvelle totalement l'esprit du personnage en en révélant l'essence adolescente avec une grâce et une finesse absolues: son "Porgi amor" ouvrant le II, est affirmation toute en délicatesse d'une aube tendre et angélique à jamais perdue . . . Ce seul air mérite les meilleures appréciations. Car Sonya Yoncheva a contrairement à la plupart de ses consoeurs, le charme, la noblesse, la subtilité et . . . surtout le caractère et l'âge du personnage. Inoubliable incarnation . . . A ses côtés, deux autres chanteuses sont du même niveau : incandescentes, naturelles, vibrantes : la Susanne (pourtant au timbre mûre) de Christiane Karg (de plus en plus naturelle et expressive: sensibilité de son ultime air avec récitatif au IV: "Giunse alfin il momento / Deh vient, non tardar, gioia bella"), et surtout l'épatante jeune soprano Angela Brower, vrai tempérament de feu dans le rôle travesti de Chérubin . 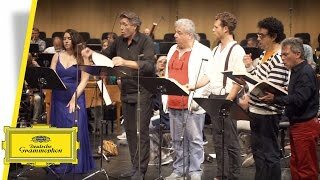 . . l'orchestre palpite et s'enivre au diapason de cette journée à perdre haleine avec la couleur trépidante, ronde du pianoforte dans récitatifs et airs; pourtant jamais précipitée, ni en manque de profondeur, la baguette de Yannick Nézet-Séguin ne se dilue, toujours proche du texte, du sentiment, de la finesse . . . Pour l'excellence des parties féminines, -- le sommet en étant la subtilité adolescente de la Comtesse de Sonya Yoncheva, pour l'allure palpitante de l'orchestre grâce à la vivacité nerveuse du chef, ce live de Baden Baden mérite tous les éloges . . .
. . . dans les "petits" rôles, on remarquera la très belle présence de la soprano suisse Regula Mühlemann (Barbarina) dont nos lignes avaient déjà relevé le talent s'affirmant lors du ballet "Carmina Burana" à Genève en mai dernier . . . Avec la soprano allemande Christiane Karg (Susanna), c'est la confirmation d'un talent . . . Ici, la simplicité de son chant alliée à la légèreté de l'expression musicale en fait une Susanna de rêve. Techniquement parfaite, Christiane Karg possède cette imperceptible acidité de l'aigu qui n'est pas sans rappeler une certaine Lucia Popp . . . Dans la fosse, le chef canadien Yannick Nézet-Séguin insuffle une belle énergie à un Chamber Orchestra of Europe enthousiaste et incisif. De la belle ouvrage! Le maître d'oeuvre en est Yannick Nézet-Séguin, qui dirige le Chamber Orchestra of Europe et un plateau de grand luxe de chanteurs entièrement dévoués à sa conception . . . y entend donc une vision puissamment moderne et qui semble pourtant si "évidente". Les récitatifs, concus bien plus musicalement que théâtralement . . . qu'ils s'enchaînent à merveille aux airs ou aux ensembles . . .
. . . [le modeste tableau rehausse] le Figaro superlatif de Pisaroni, éclatant de virilité et d'italianité. Se "vuol ballare" résonne comme une vraie menace à l'impact physique inquiétant, "Non piu andrai" d'une ironie mâle et triomphante . . . Le geste équilibré de Nézet-Séguin évite la nervosité vaine et artificielle de bien des gravures modernes. Et il n'oublie pas, dans l'Ouverture, de laisser respirer un Orchestre de chambre d'Europe uni, campé sur des basses confortables . . . le pouls du théâtre bat tout au long d'une lecture uniment saine et souriante . . .
After “Don Giovanni”, “Così fan tutte” and “Die Entführung aus dem Serail” this is the forth of Deutsche Grammophons series of seven Mozart operas conducted by Yannick Nézet-Séguin, and initiated by Rolando Villazón, in collaboration with U-Live and Festspielhaus Baden Baden.